James and Maura met eight years ago and since then they have been involved in a loving, stable relationship, considering themselves destined to be together. From the start they felt they were soul mates, so both of them were shocked to the core when they found out they were brother and sister. Their wedding day should have been a joyous occasion, where the happy couple announced their undying love for one another to the world. Friends and family should have packed into the local church and photographers should have taken beautiful pictures for their local paper. The delighted bride and groom should have danced through confetti before being waved off by an elated congregation as they were chauffeured away in a luxury car. But things were very different for the brother and sister who wed last week. The brother and sister who knew that they were defying the law by joining together in matrimony. Of course, their wedding day had to be kept as a somewhat low-key affair. There was no church, no function and no amusing tales of how the lovers’ paths crossed. But so determined are they to spend the rest of their lives together that they sealed their union during an intimate civil marriage ceremony last week. And in a further twist, the couple, who discovered they were siblings after they conceived their first child, are expecting another baby. 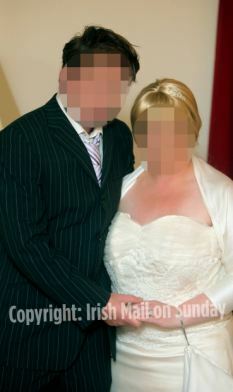 But the pressures of the secret they have shared for years is forcing them to emigrate as they fear that if they remain living in Ireland it will only be a matter of time before the authorities become aware of their identities and prosecute them for being involved in an incestuous relationship. For everybody present at last week’s ceremony it was a poignant occasion. At one stage during what was the briefest of ceremonies, James and Maura’s father became so overcome with emotion that he had to absent himself from the proceedings. And afterwards, Maura admitted that it was not the wedding day she had dreamed about ever since she was a little girl playing dress-up. But nevertheless, the couple are totally convinced they did the right thing, and they hope that by marrying they will secure the happy-ever-after ending that they yearn for. Looking stunning in her ivory wedding gown, a heavily pregnant Maura told the MoS: ‘It was a bit difficult and it was a very different day to the wedding day I would have thought that I’d have had since I was a girl. ‘I would have liked to have the big celebration and the whole church ceremony but it was fine. ‘We had our family and friends there and we had a good time. If things were different we would have had a different day,’ she went on. ‘I was nervous at first though, and it was hard for my mother but she has been very supportive. I think she finds it hard seeing us together. I thought that someone might cop on and that they’d probably cop we were brother and sister. ‘But I never had any second thoughts about going through with the wedding. A few weeks into our relationship I definitely knew that I wanted to marry James,’ says Maura. Aged in their 20s and living in Leinster, James and Maura decided to break their silence about their incestuous relationship to try to help others who find themselves in the same heartbreaking situation. And after they first spoke to the MoS last May, their story made headlines all around the world. How they met is a solitary tale of the devastating impact of lies. They grew up in separate towns about 100 miles apart and they met by chance during a night out socialising in a town neither of them is from. In fact, their meeting differed little to how another young man and woman met back in the 1980s. Back then James’s mother ‘Carmel’ was on what she no doubt believed to be an inauspicious night out with pals. The carefree young woman, who was 19 years old at the time, was not socialising in her home town. As is often the way in these situations, she still met a young man – who we shall call ‘Tom’ – who took her fancy. They dated for the next four to five weeks but the romance soon fizzled out and they went their separate ways. Fast-forward then to 20 years later when another young man and woman, this time James and Maura, meet in eerily similar circumstances. Both of them happen to be out socialising with friends in a town which neither of them is from. They are instantly smitten. So strong is their incredible mutual attraction for one another, that a week later both of them feel they have known each other for a lifetime. It was a normal, 21st century love affair: two years after they met, Maura became pregnant and so the couple moved in together. Later that year, their son Mark was born but by then James’s fraught relationship with his mother Carmel was nearing breaking point. He had not seen his ‘father’ Vincent for years. He had left the family home when James was about 10 or 11 years old, and so strained was their relationship that the young boy was relieved when his father walked out the door. However, last Christmas James decided to put aside the past hurts and visit his mother. And it was while chatting with her son about his girlfriend that Carmel began to piece together the shocking information which would have devastating implications. From her son’s answers, Carmel realised that the man she had a brief relationship back in the 1980s, was not only her son’s father, but also the father of James’s girlfriend Maura. DNA tests confirmed the truth and further disturbing information then emerged. During her brief relationship with Tom, Carmel became pregnant and when the couple went their separate ways, she did not tell her boyfriend that she was expecting his child. Instead, she married another man and this man’s name was listed on her son’s birth certificate as the child’s father. However, when James was about five years old, his real father Tom found out that he had fathered a son and he tried to get in contact with Carmel. By then he was married with a daughter – Maura – but he still desperately wanted to be a part of his young son’s life. However, James’s mother Carmel was extremely reluctant, and James’s father Tom had to go to the family law court to seek access. It was during this hearing that Carmel finally admitted that Tom was her child’s father and not the man who was listed on her son’s birth certificate. Nevertheless, the judge hearing the case decided that it would be too upsetting and disruptive for James to know his real father and Tom was denied access to his son. ‘We always planned to marry and that’s why we married,’ says newlywed James. ‘We didn’t tell any lies when we were putting the paperwork together to apply to get married. ‘But during the ceremony my heart was pounding. I knew no one was going to bust in the door but I thought someone just might. It was hard for our father and he had to leave the room at one stage, but he came back in again. ‘There was no one to stand in our way. Even if they did they would find it hard to stop us. ‘What happened to my wife and I and what was put on my birth certificate was very dishonest – and one lie lead to another. ‘Now they are looking to change the law so that transgender people can change their birth certificate – but what happened to me was covered up,’ said James. ‘Ideally, I would have liked to have had a church wedding because we are both religious. ‘We are going to have to leave Ireland because it is like a village here and it is only a matter of time before people find out who we are. Meanwhile, Maura believes that she and her husband simply have no other option but to emigrate. ‘Ever since we found out that we are brother and sister, and this has happened to us, things have not been right for us here. ‘Life has changed irreversibly and when we think of all the dishonesty which led to this happening we feel that we have to go. ‘Everything here in this country is a cover up. At least when we move abroad we won’t have to keep looking over our shoulders to see if someone has found out that we are actually brother and sister. ‘We will have freedom. I was shocked when I found out that I was expecting. This pregnancy wasn’t planned and I do worry whether the baby will be okay. ‘But then I remind myself that our first child is fine,’ says Maura. And the married couple readily admit that if they did not already have a child together with another on the way, they would have gone their separate ways by now. Recent months have been difficult, but they are becoming more comfortable apparently with the fact that they were fathered by the same man with different women. Maura explained: ‘It was a shock when we found out we’re brother and sister. But we dealt with it. ‘I deal with it by putting it to the back of my mind and not thinking about it. It’s not as if either of us had any idea what we were doing. James added: ‘We didn’t grow up together and we were with each other for a full eight years without having any idea at all that we are brother and sister. ‘Anybody else would say “oh look they are brother and sister”. We have been together for so many years now that I don’t look on her as my sister. I could never look upon her as my sister. ‘It’s kind of hard to fathom how we could be expected to act like brother and sister when we have been together so long as a couple. ‘Maura’s mother finds it hard to look at us as brother and sister. Our wedding day was hard on our father and it was hard on Maura’s mother. Our two witnesses know our story but we know that they will never tell anyone that we are really brother and sister. ‘The only people who really know the truth are our father, Maura’s mother, my mother and our two witnesses. The rest of Maura’s family does not know. Meanwhile, Maura is hopeful their new life abroad will change her and James’s lives for the better. They have already have made contact with potential employers in their new homeland and are confident that they will prosper. Maura added: ‘I hope that what happened to us wouldn’t happen to anyone else. I’m leaving Ireland a bit bitter and I feel let down. This was first published in the Daily Mail UK.